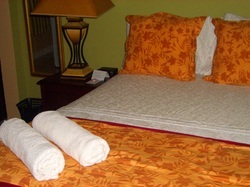 Narakiel's Inn is a recently renovated, centrally located Inn with well appointed rooms that are modestly sized. We are thrilled to be fortunate enough to be able to offer each and every one of our guests personalized attention, friendly service and local knowledge/expertise to help you get to know the real Dominica. We believe that Dominica is truly unique & exceptionally beautiful & are excited to share this top eco friendly travel destination with you! The Inn includes 6 guest units, with a front balcony overlooking the Roseau River. Narakiel’s is committed to providing our guests and associates with a smoke-free environment, which is in line with our commitment to being an environmentally friendly Inn. Therefore, all guest rooms are NON SMOKING. Additionally, the Inn is a two-floor WALK-UP and has a two night minimum stay policy.